In case you somehow hadn't heard the news since Sunday night, the Philadelphia Eagles won the Super Bowl. A historic win for our friends down in Philadelphia. I’m not much of a football fan myself, but I am a fan of the Eagles I’ve had the opportunity to capture around the area. This seemed like a good opportunity to tell you a bit about my feathered friends, and another Pennsylvania Eagles success story. As the national bird and national animal here in the United States the, Bald Eagle is an iconic symbol of our nation. Images of the eagle can be found all over the place from hats and t-shirts, right down to cash that’s in our pockets. It’s not hard to see why. They are beautiful and majestic creatures, while their massive size and razor sharp talons instill a sense of dominance within the wild kingdom. A Bald Eagle in Amish Country just outside of New Holland, Pa. We were driving on a Sunday morning and spotted the giant eagle just sitting in the field. Two Mennonite carriages passed by on nearby Voganville Road, off in the distance you can see Faremount Homes sitting on the hill in Farmersville, Pa. I don’t remember the story of the Bald Eagle being quite so cheerful when I was a kid. At the time these beautiful creatures were struggling to recover from the effects of the agricultural use of DDT in the 1950s and 60s. DDT was a synthetic organic compound used as an insecticide. It was widely available to the public by the 1940s and used heavily in agriculture before it was banned for commercial use in 1972. Ten years early Rachel Carson had published the book Silent Spring against the widespread use of DDT. It was believed to be a carcinogen and was beginning to show effects on wildlife. The book is considered foundational in the modern environmental movement, and help lead the way for the creation of the Environmental Protection Agency. The known nesting population of Eagles in Pennsylvania was only three pairs in 1980. Eagles were one of the species severely affected by DDT, and the recovery effort has taken decades. When DDT was being used the pesticides were applied to the fields, which naturally runoff into nearby rivers and streams, and as a result, the local fish populations essentially lived in the pesticides. Eagles are opportunistic feeders, but their diet largely consists of fish. While the pesticides were not directly toxic to Adult Eagles, it interfered with the bird’s calcium metabolism. It was believed to make some birds sterile, but it was mainly causing their eggs to be less dense and more brittle. Such that they couldn’t support the weight of a brooding adult. As a result, the Eagle population was aging without new offspring. While stopping by the Pequea Boat Launch to capture the frozen Susquehanna River I could hear Eagles ... somewhere. After some time these two emerged with a younger third behind them. The two were quite playful chasing each other around the ice. In the 1980s the damage was done here in Pennsylvania. However, there was a glimmer of hope in the Pennsylvania Game Commission's eagle reintroduction program. The program ran from 1983-89, and through many years of hard work, the nesting populations continue to rise to this day. In 1990 there were 8 active nests, 48 in 2000, 100+ in 2006, 150+ in 2008, 200+ in 2011, and more than 270 in 2013. Similar trends are also happening around the Chesapeake Bay and New York, but it is expected to slow at some point due to available territory. The Bald Eagle was removed from the federal Endangered Species List in 1995, and later removed from the Endangered and Threatened Species List altogether in 2007. Here in Pennsylvania its status was changed from Endangered to Protected in 2014. Despite their upgraded status, the Eagles are still protected under three federal acts, and they are heavily monitored. An Eagles nest in Amish Country near Bird in Hand, PA. One Eagle was in the nest at the time, while the other was in a nearby tree. Among the many mascots that can be found in South Philadelphia is Noah, the 3-foot tall Bald Eagle with an enourmus 7-foot wingspan. Noah is one of the Educational Birds from the Elmwood Park Zoo in Norristown. He is not an exhibit animal, and only makes appearances for educational programs within and outside the Zoo. Noah suffered an 80-foot fall when he was only eight weeks old and underwent extensive rehabilitation for years before coming to the Elmwood Park Zoo. Now he entertains and informs the public about Eagles and the importance of protecting them. While Noah isn’t an exhibit animal, a few of his friends can be seen hanging around the Zoo. After you get your tickets in the gift shop the Eagle exhibit greets you as you enter the park. There are a number of bald and golden Eagles hanging out on their perches and soaking up the sunshine in a fairly realistic environment. The open-air pen gives visitors a great view of these beautiful creatures, unlike anything I’ve seen before. How many Eagles can you spot? 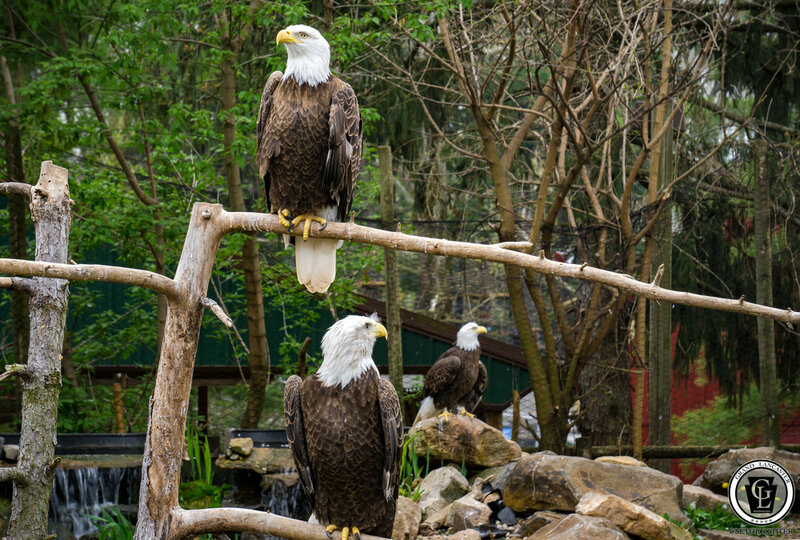 There are five in this image of the Eagle's exhibit at the Elmwood Park Zoo. A visit to Elmwood Park Zoo is enough for a post of its own. It’s a relatively small zoo compared to the Philadelphia Zoo. They fit a lot in the space they have for a reasonable price, and the close proximity you get to the animals provides an up-close look that is hard to get elsewhere. Particularly the Eagles! When I think of Bald Eagles, there is one of my photography buddies that instantly comes to mind. His name is Steven Maerz, and he captures some awesome shots of Eagles ... and waterfalls, and the stars, and ... well a whole lot of awesomeness! When I started thinking about writing this post I reached out to him immediately and asked if he would be interested in sharing a few of his photos. Golden Eagle enjoying the snow.